You do not need to leave your room. Remain sitting at your table and listen. Do not even listen, simply wait. Do not even wait, be quite still and solitary. The world will freely offer itself to you to be unmasked, it has no choice. It will roll in ecstasy at your feet. To learn the way it is important to be sharp and inconspicuous. When you are sharp, you are not confused by people. When you are inconspicuous, you do not contend with people. Not being confused by people, you are empty and spiritual. Not contending with people, you are serene and subtle. The best things in life are nearest. Breath in your nostrils, light in your eyes, flowers at your feet, duties at your hand, the path of right just before you. Jean-Auguste-Dominique Ingres. 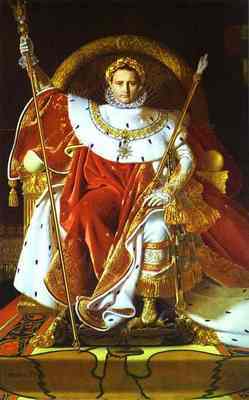 Portrait of Napoléon on the Imperial Throne. 1806. Oil on canvas. Musée de l'Armée, Paris, France. In the past few years, many of us on the American Left have found ourselves looking for understanding to the writings of historian Juan Cole. Born in Albuquerque in 1952, John "Juan" Ricardo I. Cole is professor of modern Middle Eastern and South Asian history at the University of Michigan. Not only does he have a new book entitled Napoleon's Egypt: Invading the Middle East, but he also translates works in both Arabic and Persian, and maintains a popular weblog called Informed Comment [link] . The other day Juan Cole posted an entry in which he offered notions of historical comparison that he couldn't help thinking about the Bush involvements in the Middle East, given what he'd learned about Napoleon. While I strongly believe the species' survival depends on learning at least something from history, I also think historical comparisons are a tricky business. Nevertheless the current Bush asked for it in his big speech the other day when he invoked Viet Nam as his latest scare tactic. If he wants comparisons, then let us hear Professor Cole's. Yesterday Tom Englehardt posted the essay at his site, and Juan Cole is requesting any citation of it be linked to TomGram, so I'll do that. He'll be discussing his perspective this afternoon at the New America Foundation in Washington, DC. Supposedly C-Span will be televising it live at 12:15 PM, and giving it an hour and a half. Bonaparte's laundry list of grievances about them consisted of three charges. First, the beys were, in essence, enablers of France's primary enemy at that time, the British monarchy which sought to strangle the young French republic in its cradle. Second, the rulers of Egypt were damaging France's own commerce by extorting taxes and bribes from its merchants in Cairo and Alexandria. Third, the Mamluks ruled tyrannically, having never been elected, and oppressed their subjects whom Bonaparte intended to liberate. George W. Bush, of course, hit the same highlights in his "mission accomplished" speech, while announcing on the Abraham Lincoln that "major combat operations" in Iraq "had ended." "The liberation of Iraq," he proclaimed, "is a crucial advance in the campaign against terror. We've removed an ally of al Qaeda, and cut off a source of terrorist funding." He put Saddam Hussein's secular, Arab nationalist Baath regime and the radical Muslim terrorists of al-Qaeda under the sign of September 11th, insinuating that Iraq was allied with the primary enemy of the United States and so posed an urgent menace to its security. (In fact, captured Baath Party documents show that Saddam's fretting security forces, on hearing that Abu Musab al-Zarqawi had entered Iraq, put out an all points bulletin on him, imagining -- not entirely correctly -- that he had al-Qaeda links.) Likewise, Bush promised that Iraq's alleged "weapons of mass destruction" (which existed only in his own fevered imagination) would be tracked down, again implying that Iraq posed a threat to the interests and security of the U.S., just as Bonaparte had claimed that the Mamluks menaced France. For a democracy to conduct a brutal military occupation against another country in the name of liberty seems, on the face of it, too contradictory to elicit more than hoots of derision at the hypocrisy of it all. Yet, the militant republic, ready to launch aggressive war in the name of "democracy," is everywhere in modern history, despite the myth that democracies do not typically wage wars of aggression. Ironically, some absolutist regimes, like those of modern Iran, were remarkably peaceable, if left alone by their neighbors. In contrast, republican France invaded Belgium, Holland, Spain, Germany, Italy, and Egypt in its first decade (though it went on the offensive in part in response to Austrian and Prussian moves to invade France). The United States attacked Mexico, the Seminoles and other Native polities, Hawaii, the Spanish Empire, the Philippines, Haiti, and the Dominican Republic in just the seven-plus decades from 1845 to the eve of the U.S. entry into World War I. 24 Aug 2007 @ 12:58 by vaxen : Failure? Bush is still very much with us. Anti terror laws which should bring, and do, terror to the heart of every American - have been passed, a system of Fema prisons that are meant, not for Arab terrorists, but for regular American dissenters who see the insanity of the White House, per se, are secretly waiting and being filled silently in the middle of the night of horrors you've let come upon you - Americans. Nice to be able to lay the blame at one mans feet, isn't it? Though it is true that asymetric warfare will win out over blanket bombing every time - nevertheless - Bush is not the puppet master here nor is Iraq the target. "As a general rule for understanding public policies, I insist that there are no persistent "failed" policies. Policies that do not achieve their desired outcomes for the actual powers-that-be are quickly changed. If you want to know why the U.S. policies have been what they have been for the past sixty years, you need only comply with that invaluable rule of inquiry in politics: follow the money..."
24 Aug 2007 @ 17:57 by vaxen : HaHa! Well, we know that old riff don't we? "The best things in life are nearest. Breath in your nostrils, light in your eyes, flowers at your feet, duties at your hand, the path of right just before you." 24 Aug 2007 @ 19:53 by a-d : Here. JAzzo.... whaddatiming! click here to see (at least a part of) the Bush Family Tree! 08/23/07 "ICH" --- -- No pullout from Iraq while I’m president, declares George W. Bush. Israel is a “peace-seeking state” that needs $30 billion of US taxpayers’ money for war, declares State Department official Nicholas Burns. Nor are the Democrats in the way of the Bush regime’s build up for initiating war with Iran. Finally, Bearden sums up the foregoing, starting with the things mentioned in the now famous statement by then Secretary of Defense William Cohen: the use of scalar weapons to induce earthquakes (2004 tsunami, Yellowstone) and volcanos (Cumbre Vieja, Toba supervolcano in Sumatra) and other possible target zones and weather engineering of hurricanes and droughts. Meanwhile, despite Cohen's rare statement, the Western governments appear not to have a clue. At least publicly, this major change in the capabilities of the terrorists against the United States has not been analyzed or pursued by the conventional U.S. government agencies and their traditional support analysis agencies. Specifically, the U.S. Congress has not been adequately informed, particularly of the terrible mess that our decrepit old electrical engineering really is, and the consequences of not correcting it when our foes already have done so. The secrecy of the so-called "secret government" of the United States has worked against it and nearly assured the total destruction of the West in the coming Scalar Wars http://prahlad.org/pub/bearden/scalar_wars.htm described in "Oblivion - America at the Brink." It appears too late to avoid all this for we are entering into the time window of the overt attack and the total corruption rampant in all three branches of government makes any real preventative measures impossible. Neither Congress nor the military is facing any of these issues, either from stupidity and ignorance, the vast secrecy, the power of the oil companies and energy cartels, or even the mental distortions and entrancements of the scalar weapons in psychoenergetics mode. It is above all the secrecy which is leading to our destruction. That is why I consider Tom Bearden a true hero for risking to put all this information and the science of it out there on his website and in his books. I am rather pessimistic that we can avoid, if not Tom's scenario, then some similar scenario leading to all-out overt scalar wars which will signal mankind's current unworthiness to receive the incredible boon given by nature via the energy of the vacuum. The human "race" appears to be literally a race, a race between good and evil. Good and evil race each other through history to see who will get to this incredible technology first. If good gets there first then we have a chance to create a paradise on earth and a truly sustainable civilization. If evil gets there first then we inevitably destroy ourselves and go back to the beginning and are forced to start the race all over again. Was the mythical destruction Atlantis the ending of a previous occurence of this race? This human "race?" Those of you who listen to rightwing talk radio (A deep and vicious swamp, I concede.) know that the far right talk jocks have been comparing Iraq to Vietnam for a long time. And some of Bush's talking points in his recent speech at the VFW merely echo that point of view. That the spinmeisters have merely gotten together, coagulated, and offered a new heap. And that Bush’s arguments appear to have surprised some national observers merely reveals they have not been listening. Just go to Rush, Melanie and the crowd to find out what they are thinking. Listening to the creatures of the night I was amazed to discover that there are still many Americans who believe we should have won the Vietnam War. I had thought that issue had been put to rest. That it was commonly accepted we involved ourselves in a senseless quagmire, a civil war fought by guerrillas which we could not possibly have won. Unless, of course, we should have flattened the entire country, turning it into a “parking lot.” “Destroying the country in order to save it,” as we used to often say in those bygone days. So even if Bush has been avoiding comparisons to Vietnam - that war, quagmire, which we lost - he turned the argument on its head the other night, reiterating the rehtorical lead of numerous rightwing talk show hosts, by offering the specter of the “killing fields.” For the far right has credited the rise of Pol Pot to the US’s withdrawal from Vietnam. And predicts something similar for Iraq. These Bushies are nothing if not lurid. I can still remember his 2003 State of the Union speech in which he sounded as if he were reading from “The Insidious Doctor Fu Manchu,” with his botulism, mushroom cloud, tanks of anthrax and other impending horrors. Though in Iraq we have chosen a monster to baby sit, while depending on a president who refuses to even begin to do the right thing. Such as prepare for our inevitable withdrawal. By Larry Beinhart, AlterNet. Posted August 27, 2007. George Bush and other Iraq War supporters have argued that if we withdraw from Iraq the result will be like the killing fields of Cambodia -- an odd comparison considering that the US has direct responsibility for that holocaust. • The killing fields were real. The genocide against their own people was committed by the Khmer Rouge. • The Vietnamese -- the Communist Vietnamese -- were the people who went in and put a stop to it. • The United States then supported the Khmer Rouge. Here's how that came to happen. The United States got involved in the war in Vietnam in an attempt to keep South Vietnam from going communist. Which it would have if nationwide elections had been held as promised. Cambodia is next to Vietnam. It was ruled by Prince Sihanouk. He attempted to be neutral. Both sides abused that neutrality. The North Vietnamese send arms, support and men through Cambodia on the "Ho Chi Minh Trail" to go around South Vietnamese and American forces. They also used Cambodian ports. In 1970, while Sihanouk was out of the country, visiting Europe, the USSR and China, Lon Nol took over the country in a right wing coup. There are two stories about American involvement. The first is that we supported the coup, the second (in Tom Weiner's Legacy of Ashes, The History of the CIA) is that it took the CIA and the United States by surprise. Recently declassified documents support Weiner's view. In either case, once Lon Nol took power, the US supported him. In return, Lon Nol ended the neutrality, closed the ports to the communists and demanded that the Viet Cong and North Vietnamese leave the country, and let US forces openly, though secretly, operate in Cambodia. There was resistance to Lon Nol. Some of it was certainly a spontaneous matter of national sentiment. Some of it was certainly fomented by various communist interests. Sihanouk, in China, then allied himself with the Khmer Rouge, Cambodia communists, which conferred new legitimacy on them. Civil War broke out. Lon Nol was both corrupt and inept. In spite of American financial and military support, he lost. America left Vietnam in 1973. The Khmer Rouge took the capital of Cambodia in 1975. They were one of the most horrendous regimes in history. They practiced a kind of class genocide, "re-educating" and murdering anyone who educated or Westernized, as well as minority groups. In 1978, Vietnam, by then fully Communist, invaded Cambodia to put a stop to the Khmer Rouge and drive them out. They installed a more moderate and sane regime. The United States, the UK, and China then supported the remnants of the Khmer Rouge. With their help the conflict continued for another ten years. When George Bush, or anyone else, uses the Cambodian holocaust as a warning of what might happen if America withdraws from Iraq, remember the facts. 2. The civil war that led to the victory of the Khmer Rouge came about, at least in part, because of America's support of Lon Nol. 3. The "enemy," the Vietnamese Communists, were the ones who put a stop to the Khmer Rouge. 4. The United States supported the Khmer Rouge -- after their murders, after the genocide. That support helped a civil war continue for another decade. More death, more destruction. Larry Beinhart is the author of Fog Facts: Searching for Truth in the Land of Spin. His novels include Wag the Dog, on which the film was based, and The Librarian which Rolling Stone described as "John Grisham meets Jon Stewart." Following the president's logic, our best move is to repeat a huge mistake. Oh yes. You thought the Bush administration was fresh out of ideas? You thought that with Karl Rove leaving, the administration that brought us the war in Iraq and "Mission Accomplished" had no more tricks up its sleeve? On Wednesday, speaking before a Veterans of Foreign Wars audience, President Bush did something he had previously avoided: He compared the Iraq war with the Vietnam War, agreeing that Vietnam does hold lessons for U.S. policy in Iraq. Don't fight needless wars; don't go blundering around in countries where you don't know the language, history or culture; don't underestimate the power of nationalism, ethnicity and religion to bind together -- or tear apart -- people whose interests otherwise seem to diverge or converge; and, most of all, don't imagine that military force can solve fundamentally political problems. But the president, who has his own very special set of history books, drew the public's attention to some entirely different lessons from Vietnam. To Bush, the "unmistakable legacy of Vietnam is that the price of America's withdrawal was paid by millions of innocent citizens." Right! To Bush, the tragedy of the Vietnam War is that we didn't let it drag on for another decade or so. Some might quibble with Bush's understanding of historical causation. Yes, many innocent civilians suffered in the aftermath of the U.S. withdrawal from Vietnam -- but it's more accurate to attribute their suffering to the prolongation of the war itself, rather than to the U.S. withdrawal as such. It's hard to be precise (as is the case in Iraq today, no one kept careful count of Vietnamese civilian casualties, and all sides in the conflict had an incentive to fudge the true figures), but somewhere between 1 million and 4 million civilians died as the war needlessly dragged on, many killed by U.S. weapons. Millions more were displaced. Bush went on to assert that "another price to our withdrawal from Vietnam" was the rise of "the enemy we face in today's struggle, those who came to our soil and killed thousands of citizens" on 9/11. Yup -- it's so obvious! The U.S. withdrawal from Vietnam caused the rise of Al Qaeda -- and, by extension, "our withdrawal from Vietnam" ultimately turned Iraq into "the central front" in "the war on terror." Step 1: In 1975, the Vietnam War ended and young Osama bin Laden, age 18, saw that the mighty U.S. could be brought low and that an unhappy citizenry could push a democratically elected government to end an unpopular war. Step 2: Hmm. This step is a little tougher. Al Qaeda attacked the U.S. on 9/11. Then Bin Laden, bearing the U.S. withdrawal from Vietnam constantly in mind, um . . . somehow tricked us into going to war in Iraq . . . where Al Qaeda had no presence prior to the U.S. invasion . . . because he knew we'd make a mess of things . . . and that Al Qaeda could move in while we were bogged down fighting insurgents . . . and bog us down even more? And from there, we easily reach Step 3: We are stuck in a quagmire in Iraq, just as in Vietnam! Millions of civilians are paying the price for U.S. over-reaching -- just as in Vietnam! Our credibility is suffering -- just as in Vietnam! The American public has lost faith in the war -- just as in Vietnam! Bin Laden is happy to see us brought low -- just as in Vietnam! If we leave, more bad things may happen, and Bin Laden will also be happy -- just as in Vietnam! Step 4. Therefore, as the president explained Wednesday, we must stay in Iraq forever, until every last terrorist or every last Iraqi civilian is dead, whichever comes first. But Bush forgot to mention Step 5, which follows logically from Steps 1 to 4. How can we show the innocent civilians of Southeast Asia that we haven't forgotten them and simultaneously send a message of resolve to the Iraqi people? How can we show Al Qaeda once and for all that the U.S. is not to be trifled with? Because no matter what they say -- it's never too late to repeat the mistakes of the past. Bush does seem to love to speak before audiences in uniform. Or "by invitation only." A week ago it was the VFW. Now I understand he's going to talk to the American Legion today. This should remind us of Vietnam, since those two veterans groups would have gladly held on to the very end. No lack of "patriotism" there. 29 Aug 2007 @ 19:05 by quinty : And Bush found his audience! "'Iran's active pursuit of technology that could lead to nuclear weapons threatens to put a region already known for instability and violence under the shadow of a nuclear holocaust,' he told a veterans group here. "Bush's speech to the American Legion aimed to convince a war-weary US public that the war in Iraq was the central front in the fight against what he described as the Sunni Muslim extremism of the Al-Qaeda terrorist network and the Shiite extremism fuelled by Iran." What Bush apparently didn't remark upon was Maliki and Ahmadinijad walking hand in hand with big smiles on their faces in Tehran a week or two ago. is "nuclear." The Pres., is whose mouthpiece? What he does and says matters little...therre are far worse weapons being utilised than anything in the nuclear arsenal...it is possible right now to dud every single nuike...worldwide. Go beyond Bush, he is not relevent at all, nor is what the media 'says.' Nor what Washington says...they are all obsolete. Once upon a time, it was the United States that urged all nations to obey the letter and the spirit of international treaties and protect human rights and liberties. American leaders denounced secret prisons where people were held without charges, tortured and killed. And the people in much of the world, if not their governments, respected the United States for its values. The Bush administration has dishonored that history and squandered that respect. As an article on this newspaper’s front page last week laid out in disturbing detail, President Bush and his aides have not only condoned torture and abuse at secret prisons, but they have conducted a systematic campaign to mislead Congress, the American people and the world about those policies. After the attacks of 9/11, Mr. Bush authorized the creation of extralegal detention camps where Central Intelligence Agency operatives were told to extract information from prisoners who were captured and held in secret. Some of their methods — simulated drownings, extreme ranges of heat and cold, prolonged stress positions and isolation — had been classified as torture for decades by civilized nations. The administration clearly knew this; the C.I.A. modeled its techniques on the dungeons of Egypt, Saudi Arabia and the Soviet Union. That allowed the White House to claim that it did not condone torture, and to stampede Congress into passing laws that shielded the interrogators who abused prisoners, and the men who ordered them to do it, from any kind of legal accountability. Mr. Bush and his aides were still clinging to their rationalizations at the end of last week. The president declared that Americans do not torture prisoners and that Congress had been fully briefed on his detention policies. Neither statement was true — at least in what the White House once scorned as the “reality-based community” — and Senator John Rockefeller, chairman of the Intelligence Committee, was right to be furious. He demanded all of the “opinions of the Justice Department analyzing the legality” of detention and interrogation policies. Lawmakers, who for too long have been bullied and intimidated by the White House, should rewrite the Detainee Treatment Act and the Military Commissions Act to conform with actual American laws and values. For the rest of the nation, there is an immediate question: Is this really who we are? Is this the country whose president declared, “Mr. Gorbachev, tear down this wall,” and then managed the collapse of Communism with minimum bloodshed and maximum dignity in the twilight of the 20th century? Or is this a nation that tortures human beings and then concocts legal sophistries to confuse the world and avoid accountability before American voters? Truly banning the use of torture would not jeopardize American lives; experts in these matters generally agree that torture produces false confessions. Restoring the rule of law to Guantánamo Bay would not set terrorists free; the truly guilty could be tried for their crimes in a way that does not mock American values. Clinging to the administration’s policies will only cause further harm to America’s global image and to our legal system. It also will add immeasurably to the risk facing any man or woman captured while wearing America’s uniform or serving in its intelligence forces. Both Frank Rich and Maureen Dowd go after the slimeball behaviors of Supreme Court Justice Clarence Thomas today. I'll tell ya, I wouldn't want the two of them after me in print at the same time! At least the pitiful judge's book tour has reminded us of how Anita Hill is doing these days: teaching at Brandeis. Not bad! Whew, and all this workout before church! I think a nap to Brahms will be in order this afternoon. There was a brief, interesting piece on CNN last week. The American covert ops who interrogated Nazis during World War Two finally opened up, discussing their activities for the first time. How did one of their top interrogators get information from Rudolph Hess? By playing chess with him. These aging intelligence men were, naturally, appalled by the American practice of torture today, and claim they never used it. That playing chess with the Nazis in their custody was a far more effective method of obtaining information. MP3s: The More You Sell http://blogfiles.wfmu.org/KF/mind/30_-_Studio_LaRoux_In_House_Announcer_-_The_More_You_Sell.mp3 (retail motivational training from The Happy Listener's Guide to Mind Control) and Kris Jensen's Torture http://blogfiles.wfmu.org/KF/Kris_Jensen_-_Torture.mp3 . Hi, I'm currently deployed to Iraq and recently discovered your program. Since then My tank crew and I listen whenever we get the chance. The reason I'm writing is that we have been looking for anything we can find by happy flowers, not just because I think My Skin Covers My Body is the greatest record of all time, but also It's perfect for Psychological Warfare. Well, the only song we have here is Charlie Got a Haircut and we've used it so much, we can't stand it. Basically I wanted to check if you know somewhere we can score some Happy Flowers we can then load onto an Ipod to use on the Iraqis. Any suggestions would be appreciated. A new report has linked the mysterious flight of a nuclear armed B-52 bomber to the US Vice President's secret plan to attack Iran. Earlier, news outlets revealed that, on August 30, a B-52 bomber loaded with six nuclear armed cruise missiles had flown for more than three hours over several states. The incident prompted an Air Force investigation and the firing of one commander. The report by Webster Tarpley published on Rense website on Saturday claimed that many analysts believed those weapons were destined to be used in a nuclear blitz on Iran, which may have been scheduled for September 6, the day that Israel launched its own aerial attack on Syria. Many sources (see Wayne Madsen Report, September 24) agree that the transfer of these nuclear weapons to Iran was blocked by US Air Force personnel, backed up by anti-Cheney factions in the intelligence community, who refused to obey an illegal order. It is also important to note that some half dozen personnel linked to the Minot and Barksdale air bases have reportedly died under mysterious circumstances since July. Elsewhere in his report, Tarpley quotes his sources as saying that "It is unlikely that a sneak attack on Iran could get through the normal channels of the US national security interagency process. The realization of Cheney's war plan depends upon an outside manufactured event, along the lines of 9/11, which could be used to engineer the typical neocon end run around the standard operating procedures and launch the wider war." Webster Griffin Tarpley is an author, lecturer, and critic of US foreign and domestic policy. He maintains that the events of 9/11 were engineered by the military and arms industries. He envisions a model of false flag terror operated by a rogue network of independent operatives in the privatized military intelligence sector and corporate media. take pride in often doing without any money at all, as my family has found ourselves necessarily disciplining these past 2 weeks. We invested rather a lot in greening the house this summer, and now must pay the counterfeiter. You libertarians, on the other hand, kiss all your greenbacks good night and tuck them into bed. I dread to think what will happen if liberals ever get back into office and take a look in the treasury vaults. Maybe the 'Moondog Madrigal Puppet Show' would be more to quinty sans' liking? Jobs, reputation, funding. Ah yes... The idea is to indoctrinate not educate. Educational Institutions, gotta love em. Check out executive order 12356 and weep for General Stubblebine. Or don't. Beware of the Pegasus Assassination Unit while driving to work especially if you're a liberal. But blood is blood. It is one planet regardless of your belief system and who you think you are. Or should I say who you are behavior modded into being. Our genes are, in fact, our cosmic connection. How few are not mind controlled and what is the Global Agenda? U.N. Agenda 21? http://jimchannon.com/ is a cool site. Need a consultant? but that's the least of our troubles. Of course Paul is right, and Vaxen is singing his variation. These guys actually agree with each other: nothing a fine bottle of wine shared in a half hour conversation couldn't settle. music was nuts. But oddly beautiful too. In a way standing out on a street corner of New York, mid summer or mid winter, consumed with the music of the spheres is a fitting and noble enterprise. That proud loneliness as all the rigid dark suits and office types pass by. Did Moondog feel their contempt? Did he care? Did he see the moon in broad daylight? There’s the irony of life, one which you, as a Christian, should feel. (If you'll forgive my presumption?) We all admire Christ, but who wants to make the sacrifice? Anyway, Moondog would be nuts even in a sane world. One which saw dressing up like the sharks on their way to work in the morning as actually nuts. That the outsider contemplating a blade of grass working its way up through a cement crack is the sane and sensible one. Moondog always brings up this contradiction. For, after all, we have to feed our children. And that may involve putting on a suit and tie. How many masks are there in offices all over the world? God, seen from that perspective, the whole world is nuts. Anyone for Charles Bukowski? who said "we all admire Christ?" Not I said the serpent to the dove. Not even at X-Mas. Besides, Christ was only a hologram that we projected back to then from a thousand years in the future as a joke! At 46th and Vine as you stand there in the wind, waiting for a taxi, on Christmas day, and some rabbi saunters on by, with smuggled diamonds in his Tfilin, singing the song of the Volga boatmen - while whistling Dixie - to the tune of Robespierres' Sonnet, in C Sharp major, dressed as a libidinous clown and smelling like Mahalia Jackson after a concert at the Garden. Intelligence is broken down into three fundamental aspects: Collection, Interpretation, and Dissemination. Love Problem Solution Baba Can Solve The Divorce Problems.